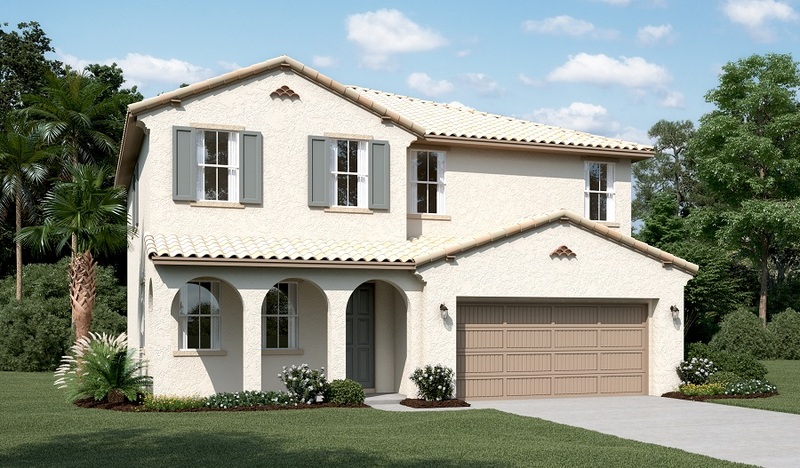 As you enter this model home, you'll notice an elegant study with French doors off the entryway. Toward the back of the home, a generous great room offers access to a covered patio, and also faces a deluxe kitchen with a large curved island, stainless-steel appliances, a walk-in pantry and a nearby mud room—featuring a built-in bench with cubby storage. You'll also find a formal dining room off the kitchen, showcasing a beamed ceiling and access to the patio via bi-fold doors. Upstairs, explore a spacious loft, laundry room, three bedrooms and a master suite with a roomy walk-in closet and private bath, boasting dual vanity sinks and a walk-in shower.